Pet friendly hotels in Austin are plentiful and gushing in southern hospitality! While there are many good places to stay, there are some that really roll out the red carpet for you and your pets. Make sure to check out our Austin Travel Guide for pet owners, where you can find everything that’s pet friendly in this wonderful Southern city. The legendary Driskill Hotel welcomes pets with true Texan hospitality. In fact, the hotel is recognized as the nation’s most pet-friendly hotel. From arrival to departure, the Driskill’s Pamperered Pet Program is second to none. Pets are provided with a custom Driskill pet bed, designer dishes and mats, souvenir pet toys and a full supply of doggie business bags. For some culinary delight, the hotels cooks up custom treats from its 1886 Café and Bakery served with bottled spring water. Pet owners are provided with Driskill logo leashes and even given a map of Austin with designated pet-friendly areas. 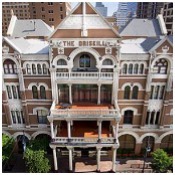 The Driskill Hotel offers bike rentals with pet carriers for biking up Brazos Street or biking to Barton Springs. Patrons can experience Austin just like a local. The hotel is also within walking distance to many music clubs, including the Austin Music Hall, La Zona Rosa and the Long Center for the Performing Arts. Book early for the best rates. The Aloft Austin at the Domain welcomes pets up to 40 pounds, and there is no pet fee. The hotel has its own pet program known as the ARF. Pets are provided with a doggie bag of treats and toys. The hotel also provides designer pet beds and pet bowls. The hotel is ideally located to many pet-friendly restaurants. Mozart’s Coffee Roasters serves up the finest gourmet coffees and most delicious desserts. There’s an outdoor deck overlooking the scenic Lake Austin, and pets are allowed on the patio. Surrounded by live music and huge oak trees, the restaurant is the perfect destination for pet owners. Aloft Austin is just a few minutes from Lady Bird Lake. Surrounded by towering pecan trees, there are many hiking trails where leashed pets are allowed. Pets can take a dip in the lake and chase the small paddle boats that float by. It’s a great place for pets to cut loose. While the LaQuinta Inn & Suites Austin Southwest at Mopac and La Quinta Inn Austin North don’t “put on the dog,” they are sure bets for you and your pet. At these pet friendly hotels, pets stay free and the best part is, there is no pet deposit is required. Cats and dogs up to 50 pounds are welcome. Housekeeping services for rooms with pets require pet owner to be present or pet must be crated. There are other good pet friendly hotels in Austin, but the Driskell Hotel, the Aloft Austin and the La Quinta offer the best in pet amenities and location in a variety of price ranges. The key to any travel deals is to book your rooms early. If this is your first time traveling with pets, make sure to read our Traveling with Pets Tips before taking off on your journey. Then start your search for pet friendly hotels in Austin. Remember, booking early is key when traveling with pets!